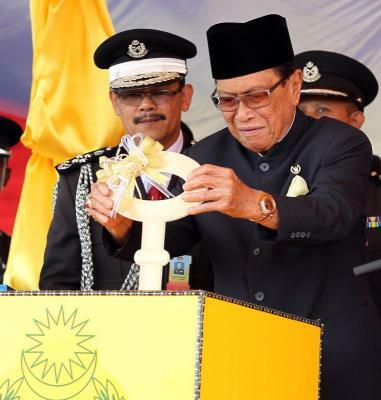 KUCHING: After a long wait since its construction began in May 1997, the Kuching Prison Complex at KM22 Jalan Puncak Borneo near here, was at last officially opened yesterday. Head of State Tun Abang Muhammad Salahuddin Abang Barieng officiated at the historic occasion witnessed by Deputy Chief Minister Tan Sri Alfred Jabu and Prisons director-general Datuk Zulkifli Omar. The Prison Complex, dubbed as one of the most expensive projects in the state, was partly completed in 2008. Zulkifli Omar who spoke at its launch said the facility could accommodate some 1,500 inmates and 500 prison staffs. He said the complex was the fifth in the state with one each in Sri Aman, Sibu, Miri and Lim-bang. Construction on the project actually began in May 1997 at an initial cost of RM165mil and was scheduled for completion by August 2000. The project, however, was almost scrapped when its first contractor not only failed to complete but abandoned it. The contractor was later terminated. The project only resume construction following a directive by the then Prime Minister Datuk Seri Abdullah Ahmad Badawi when he visited it in 2006 albeit on a reduced scale. The complex was to replace the dilapidated 120-year-old prison along Jalan Tabuan. Tenants started to move into the complex sometime in October, 2008.